Aerobic fitness tests are useful for determining your aerobic fitness level and for seeing your improvement after a period of aerobic exercise training. Sub-maximal exercise tests do not require all-out effort and can be effective in estimating and predicting your maximal oxygen uptake. Aerobic fitness tests can be done on a treadmill, an exercise bike or on a track or other safe place to walk or run. Regardless of the type of fitness test used, the American College of Sports Medicine, or ACSM, recommends that certain procedures be followed. It recommends obtaining your resting blood pressure and heart rate immediately before starting your exercise. It also suggests that you become familiar with the equipment used during the test and the testing procedures. 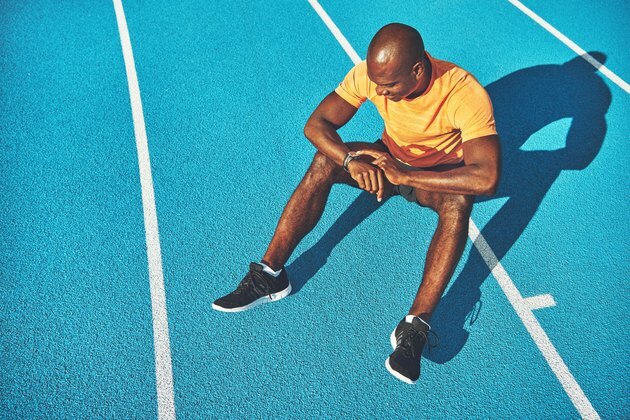 A certified exercise specialist can help you determine which type of sub-maximal fitness test is right for you and use the appropriate formula to interpret your results after testing. The Rockport Walk Test is a sub-maximal exercise test that can be done on a treadmill or on a track. It is used for people who are generally less fit and cannot run for very long, if at all. Walk as fast as you can for one mile, but at a pace that you can sustain for the entire distance. Immediately after you complete the mile, check your heart rate and note the time it took you to complete the distance. You will use this number as well as your weight, age and gender to determine your results. The 1-mile jog test is typically used for fitter people, compared to the Rockport Walk Test. Using a scale, record your weight. Warm up for 10 minutes with an easy jog. Set your stopwatch and jog one mile at a steady pace. To make sure the test stays sub-maximal, your run time should not be less than eight minutes for men or less than nine minutes for women. Upon finishing the mile, immediately take your pulse and record your heart rate. You will need your weight and heart rate to calculate your results. The YMCA Cycle Test is a multi-stage sub-maximal test that can also help you estimate your aerobic fitness, however it is more applicable for cyclists who are already familiar with the equipment. This test should be administered by an exercise specialist as it requires specific procedures and equipment, including a cycle ergometer and a blood pressure cuff. Prior to the test, weight, height, resting blood pressure and resting heart rate should be recorded. You should also adjust the seat and handle bars and practice the pacing before the test begins. Begin by pedaling at a rate of 50 RPM for three minutes. At the end of the stage, heart rate and blood pressure are recorded and the work load is increased based on heart rate. Do the same in stages two and three, adjusting the work load as necessary. At minute 9, the test is complete and there is a 5-minute cool down. Throughout the test, the administrator will measure and record your blood pressure and pulse and ask you your rate of perceived exertion, or RPE. This is a scale that measures your feelings of fatigue and how strenuous the exercise is for you. All of the information collected will be used by the administrator to determine your results.